If you work in the youth safety space, you know that certain initiatives (such as resilience building) have focused on targets of bullying and cyberbullying. Other programming has concentrated attention on aggressors – to the kids who harass, humiliate, and threaten other youth offline and online. Here, restorative practices and social emotional learning (anger management, self-control, empathy building, mindfulness, and self-awareness practices) have helped some kids better understand why they act out, and get to the bottom of the root issues that are manifesting in the physical bullying of others. However, what else can be done? First, Attachment has to do with the number and strength of their connections to “prosocial” others – mainly adults are solid, upstanding members of society. If there is a strong link, those kids will not be keen to make (problematic) decisions that will ruin what those upstanding peers and adults think of them. If there is a weak or non-existent link, they will often do whatever they want without concern about their image in the face of others. Commitment has to do with how invested a teen is in the social norms and institutions of the day. Are they committed to adhering to the existing expectations and responsibilities society has for young persons, such as trying to do well in school, being involved in school and after-school activities, going to college, and landing a job with upward mobility? If yes, they are more likely to be involved in conventional behavior. If not, they are more likely to engage in deviance. Involvement has to do with what takes up their time and energy. As a simple example, if an adolescent is busy with various positive activities after school and on weekends (like team sports, or Scouting, or theater/art, or community service – or even just doing their homework or helping around the house), they simply do not have space in their life to engage in as much wrongdoing. If they are idle, or if they hang out with questionable crowds, it is much more likely they will get into trouble. Finally, Belief involves whether kids view the rules and behavioral expectations of society as morally valid and appropriate. If yes, their actions will mirror those beliefs. If no, they will thumb their nose at the existing social order and feel free to act in any way they want. So let’s bring this back to bullying and cyberbullying. While serving in Dublin, I was chatting with a colleague who works with kids in the school system. She shared with me what her team has been doing with those who mistreat others – and how it’s really making a world of difference. To begin, everyone at this school knows the kids on campus who are the meanest (and, who many times hold a significant amount of social capital). While they don’t all naturally hang out together, the way they behave has grouped them informally into a powerful collective. And this has given them a platform, because they clearly hold and wield influence. Of course, they aren’t utilizing their leadership potential in the most positive manner – as others just try to stay out of their way – but they are still leaders. For years, most of the adults engaged only reactively with them, and tried to address their misbehaviors on a case-by-case basis designed to reduce harm experienced by the target. 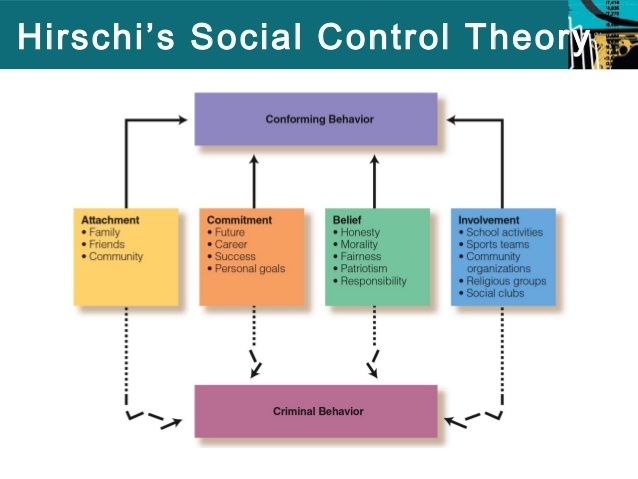 Recently, however, they have taken a new tack – which completely reminds me of Hirschi’s social bond theory – even if those involved didn’t think about it. First, the administrator develops a relationship with the student leader (a.k.a. known aggressor).. They explain that as the adults in charge of the school, they have a mission and mandate to make sure that it is safe, and that everyone feels welcomed, comfortable, and free to learn and enjoy others there. And they then state that they absolutely need the student leader’s assistance to accomplish this goal. This is the Attachment component of the Social Bond! They then shared about how sometimes kids get picked on by bullies at school because they are new, or different, or don’t perfectly fit in somehow. And they asked the student if they’ve ever seen it happen, and if they think it’s wrong or right, undeserved or deserved. All respond that it’s wrong and undeserved. This is the Commitment component of the Social Bond! Next, the administrator specifically tasks the adolescent with a call to action. In most cases, she assigns that student leader to watch over another kid who is new to school, or who has been dealing with repeated harassment recently. The adult conveys that it is crucial for this kid to be protected, encouraged, and supported – and that the school is counting on and believing in that student leader to rise up and make this happen, and spend as much time and energy as needed to do so. This is the Involvement component of the Social Bond! Finally, the student leader befriends the bullied kid in some way, shape, or form, and at the very least serves as a caring friend on campus who has “got their back” and who will intervene and help if victimization starts to occur again. The student leader then is esteemed by the bullied kid, by other students on campus who notice the good work, and also by faculty and staff who saw his or her potential. Social capital gained through negative attitudes and actions is now being used to make a positive difference. And the student leader begins to regularly see that life works a lot better for all involved when everyone respects and adheres to the social contract in place – which continues to have a constructive effect on his value system, school experience, role and purpose, attitude and perspective, and future choices. This is the Belief component of the Social Bond! While I haven’t seen it in practice, the administrator I spoke with said it is working really well. I asked if the meanest kids who have now become helpful advocates are consequently targeted for bullying by others because they now appear soft. My colleague said that hasn’t happened, because once identified they are meaningfully enlisted in service by the school to come through for others (and there are always other students in need of support, protection, and simply a friend in their life). And they are being commended as they find a niche in which they can contribute productively to the lives of others – and to the school they attend. I’m sure this doesn’t work perfectly with all potential aggressors, but I believe it can with most. It’s easy to vilify “bullies” and throw them out with the proverbial bathwater, but they deserve our concerted attention as well (particularly given that research has shown targets as well as aggressors both suffer from psychological distress). We must remember that the kids we serve at school and in our communities sometimes may make poor interpersonal choices, but deep down just want to be believed in, supported, and appreciated for the good they can offer to the world. So let’s help them offer that good to the world.